The United Nations says opium production in Afghanistan has "soared to frightening record levels" with an increase on last year of more than a third. The UN Office on Drugs and Crime report says the amount of opium produced has doubled in the last two years, and that Helmand province is now the biggest single drug producing area in the world - surpassing whole countries. Despite billions of dollars of aid and tens of thousands of international troops, the 193,000 hectares of opium poppies grown in Afghanistan this year are now responsible for almost all the world's opiates, according to the UN report. "The results are very bad, terrifyingly bad," said Antonio Maria Costa, the head of UN Office on Drugs and Crime. Cultivation was at a historic level, he said, pointing out that the total yield was up 34% because the weather had made the poppies more productive. 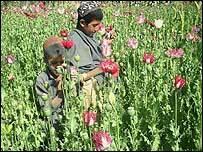 But despite the overall increase, twice as many provinces are now drug-free in northern and central Afghanistan, and the report says growing opium poppies is now closely linked to the insurgency and the instability in the south. The UN report links the Taleban to the increase in opiate production. The figures come as a major setback for British efforts to reduce the amount of opium poppies grown in Afghanistan - the raw materials for most of the UK and Europe's heroin. They are the lead nation fighting the war against drug growers and traffickers. The British ambassador, Sir Sherard Cowper-Coles, said: "It paints a very serious picture and we are deeply concerned. "The drugs problem is a symptom of a deeper disease and as we tackle instability, tackle disorder and the insurgency, we are facing some very big challenges on all those fronts, but as we tackle them we will see poppy production go down. "The overall conclusion is that there are no magic solutions, no silver bullets, and that this requires patience. As experience in Pakistan or Thailand shows, it takes 15 or 20 years to squeeze a cancer like this out of a society as debilitated as Afghanistan's is after 30 years of war," he said. The report recommends more determined efforts to bring security, urging the government to get tough on corruption which it says is driving the drugs trade. It lists poor governance, a weak judiciary and failing eradication programmes as contributing factors. For another year the eradication efforts were hampered not just by corruption in the national government, but also by corruption at local levels. Arguments have been put forward for a change of strategy - one campaign group is trying to pilot programmes to legalise drug production, and the American Ambassador, Bill Wood, believes aerial spraying could make a huge impact. "Yes, it's still my view," he said. "We all agree illicit narcotics are a cancer and as consulting physicians, some emphasise radiation therapy, some surgery. I'm a surgery man myself, but we all agree we have to cut the cancer out and we are committed to a much more robust effort this year. "Alternative livelihood for the farmers is one element, the second element is interdiction and the third is eradication. All three of those elements are necessary for a counter-drugs policy." And emphasis is being placed on the Afghan government to put its house in order and crack down on the drugs lords. The UN says it has given a list of names, and the British government has funded a high-security prison for the "Mr Bigs", but still there is little progress. The acting Minister for Counter Narcotics, General Khodaidad, says these targets will be pursued, but there is little evidence on the ground that this is happening, with some in the government alleged to have links with the traffickers, while the judiciary is still struggling to keep up. "Unfortunately we have failed," Gen Khodaidad said. "In security we have failed, in the drug issue we have failed. We have not done a good job in Helmand. 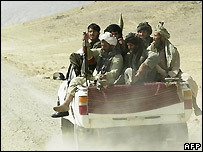 This year we must change our strategy on how to work to handle security and tackle the poppy in Helmand province."